Enjoy An Afternoon Full of Family Activities that will Leave You in the Winter Spirit! “Season’s Greetings” from Longwoods Road Conservation Area and Ska-Nah-Doht Village and Museum! The Lower Thames Valley Conservation Authority brings “Season’s Greetings” to you all at Longwoods Road Conservation Area and the Ska-Nah-Doht Village and Museum on Sunday, November 25 from noon until 4 pm. Enjoy an afternoon of family activities that will be sure to leave you in the Winter Spirit! Just $8 per vehicle! Coin or credit card at the Pay and Display Machine at the Entrance. 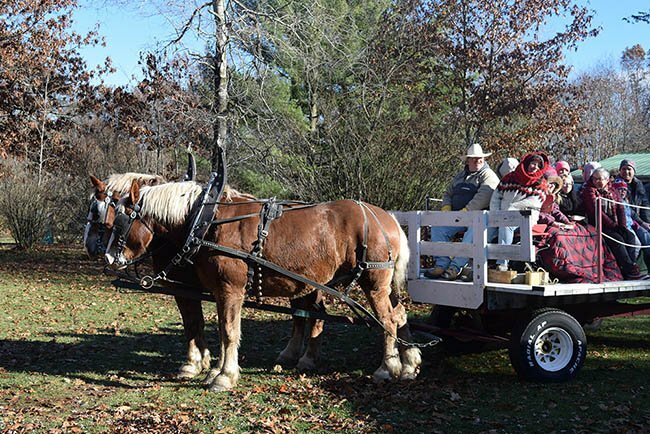 Take a Horse Drawn Wagon Ride through the park … pulled by a team of majestic Belgian horses from Bar H Ranch of Melbourne! Hot food sales from the Mount Brdyges Lions Club! And Listen to the Songs of the Season with ‘Imagine That’ Quartet! Recycle those old Greeting Cards into seasonal crafts! Bring out your own old cards or use some of ours! We will have plans and supplies for you in the Resource Centre to design your own unique creation to take home! Great for the kids! Some new crafts too! Shop in the Resource Centre for that one of a kind Holiday gift! Featuring “The Glass Tree – Stained Glass Designs” by local artist Elvira Pupinski and Longwoods’ “Turtle Trail Gift Shop” – Beadwork, Stained Glass, Leather Craft and amazing photography of Justin Garant. New this year are the one of a kind crafts by ‘Novel Ideas’! Beautiful wreaths and décor by Natalie Barrett and much more! Learn about Feeding Winter Birds Outside at our Feeder Station. Then enjoy a Guided Family Friendly Nature Walk along the Carey Carolinian Arboretum and Trail! Warm up afterwards with a hot chocolate! For further information call (519) 264-2420.
just southwest of Mount Brydges.